Far away from the Spanish mainland are the beautiful Canary Islands. Lanzarote is the fourth largest of these islands. Volcanic in origin, it is located close to the African coast and despite being a Spanish province is autonomous and has its own council that governs it. Tourism and agriculture are the island’s two major industries, so it is no surprise that the fantastic surfing conditions that exist around the island and the facilities available for those travelling here are world class. It may seem a little surprising, but the best surfing conditions exist in the region during the winter months from late November until March. With waves breaking head high and reaching heights of over 14ft, the region has been described as the “Hawaii of the Atlantic” and with good reason. The conditions around the different coastlines offer perfect surfing locations for both the experienced surfer and the beginner, looking for the perfect location to perfect their new sport. 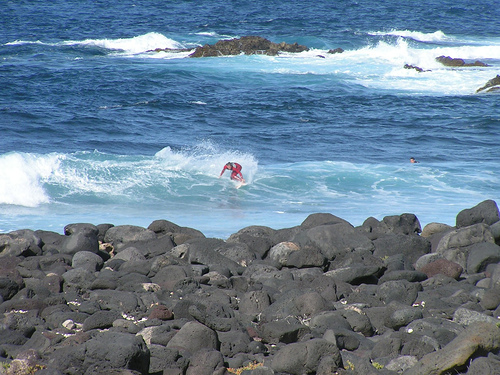 Grab a car and follow the surf trail to the five locations in Lanzarote offering the best waves. Located on the east coast of the northern aspect of Lanzarote, the Haria Coast has four major beaches offering ideal conditions. Many of the points between Orzola and Arietta are extremely dangerous and newcomers to the region should stick to the four major break beaches within this region. These beaches are suitable for beginners to experienced surfers. 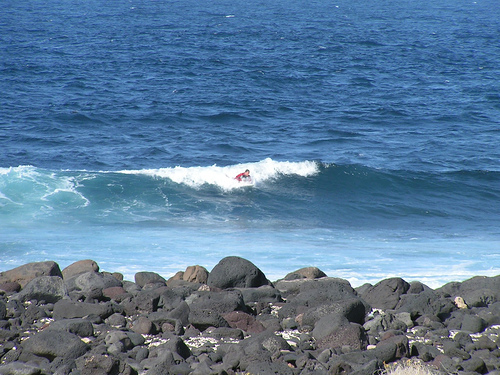 Orzola Beach is ideal for beginners and more experienced surfers will like the breaks at Jameos. Conditions along the coast do vary and finding the best waves to suit your experience is worthwhile, There are many reasons to visit these locations apart from the surfing conditions. You can enjoy quaint fishing villages, excellent amenities (some a short drive from the surfing locations), and beautiful scenery. Many areas are world heritage listed sites and worthy of a visit whilst on the island. Each location has its own appeal. There is little nightlife available at the major surf locations, but most people head to the capital city of Lanzarote at Puerto del Carmen on the East Coast. This is an easy trip by good roads from either the east or west coast. The routes are scenic and with a distance of only 60km from north to south and 25km east to west, road travel is easy. Here you can find pubs and clubs at the world-class resorts and the perfect entry and exit port for your travels around the island. This entry was posted in Europe, Surfing, Travel, Water Sports and tagged Lanzarote, Surfing. Bookmark the permalink.